For every organization, Cloud CMS is part of the future. For many, it is the only future. Up until the last decade, enterprise technology ran exclusively on racks of servers inside corporate datacenters. New applications came with hefty implementation, integration, storage and security overhead. Appropriately, IT departments had big budgets and wide control. The cloud shifts the layers of an IT stack—applications, storage, middleware, networking, security, computation horsepower—into a massive, redundant, globally distributed network of datacenters. Now the only requirement for access is an internet connection. Applications like cloud document management and workflow automation are bought by the sip rather than by the gallon. Services can be acquired via operational expense versus capital expense. Cloud workﬂow and document management services follow a path of try ﬁrst → buy small → scale up. This is 180-degree ﬂip from tradition, which was buy big → implement → hope it sticks. The burden of security, redundancy and scalability are shifted to the cloud services provider. Business owners focus on process optimization and worker productivity. 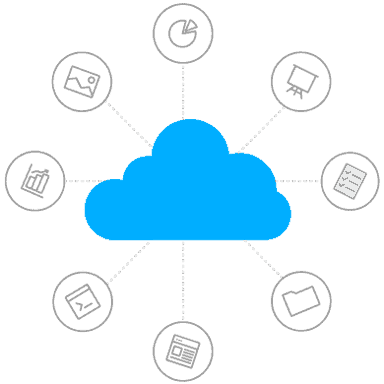 When it comes to your journey to the cloud, there are few better places to start than document management and workflow automation that benefit processes within accounting and ﬁnance, human resources, legal and other departments. New room to innovate: Don’t just gain bottom-line efficiency: leverage your new pace of performance on work that contributes to top-line growth. Connected customer experience: Deliver faster response times and more accurate decision-making across every touchpoint of the customer experience. Zero-barrier participation: Central offices, remote workers, distributed teams and mobile individuals enjoy the same experience for complete process transparency. Full compliance support: Continue to support HIPAA, Sarbanes-Oxley, GDPR and other mandates.